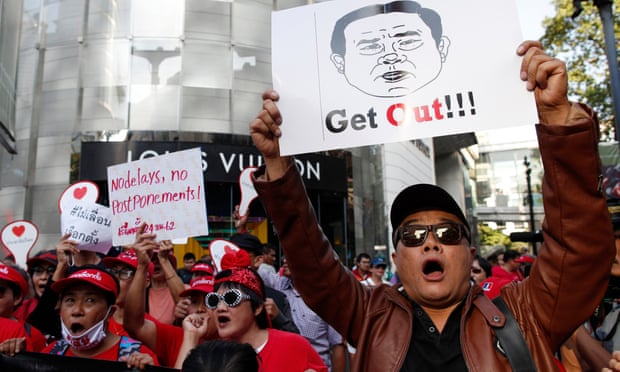 It is the fifth time the military junta, which took over in a bloodless coup in 2014, has delayed elections and prevented the country’s return to democracy. Known as the National Council for Peace and Order (NCPO), it has repeatedly declared the country is “not ready” for elections but the most recent delay has been attributed to concerns it would interfere with the upcoming coronation of the new king. Over the weekend about 200 demonstrators gathered at Bangkok’s Ratchaprasong Intersection – the symbolic spot where dozens of pro-democracy demonstrators were killed in an army assault in 2010 – carrying banners demanding an election by next month, while smaller groups gathered in other cities across Thailand. The army’s commander in chief, General Apirat Kongsompong, publicly condemned the protesters, saying they were “bent on causing trouble”. “They are being told to think this way, ordered to behave this way, thinking in one single mode without taking into consideration other factors which are reasonable and without looking at the constitution,” Aparit, who is also secretary general of the NCPO, told a media conference. While many in Thailand are sceptical about the promised elections ever taking place, the February date seemed almost secure after a promising announcement by the election commission late last year. The ban on political activity and gatherings of more than five people was also lifted in late December, the strongest indicator that elections would go ahead. But election hopes were dashed again in early January when the military failed to issue the awaited official decree, which formalises the election date. Days later, deputy prime minister Wissanu Krea-ngam indicated the poll would be postponed because it could interfere with rituals and preparations for the coronation of Thailand’s King Maha Vajiralongkorn, which will be held on 4-6 May. The election commission has not yet formally announced the postponement but the ongoing delay in the decree now makes it highly likely. Thailand’s last official election was eight years ago, in 2011, and occurred following months of pro-democracy protests by activists known as the “red shirts”, and saw the election of Yingluck Shinawatra, Thailand’s first female prime minister and the sister of former prime minister Thaksin Shinawatra. Another poll was held again in 2014, but it was later invalidated by the constitutional court, and the military took power in a coup shortly after. According to Thailand’s new constitution, which skews the political system heavily in favour of maintaining military power, an election must happen by 9 May.